People who are still looking to obtain these great posters will be somewhat let down. It has been confirmed that the posters are out of stock, people who ordered these posters late will have got a message saying that its on backorder. Don't let this get you down though, you will recieve the posters next month or before the month is over. 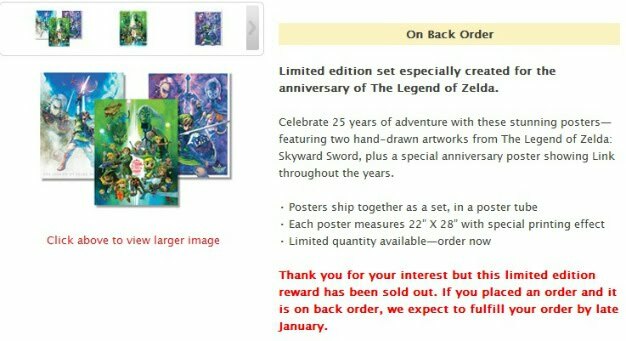 For those of you who have ordered these posters earlier this January, Nintendo has informed that your poster will arrive around week 3 of February. I myself received an email from Nintendo stating this. "After 9 months of building, rebuilding, and planning, the Hyrulecraft Server is now live for a limited time preview! If you haven’t seen or heard anything about Hyrulecraft before, well then it is time you’ve begun! 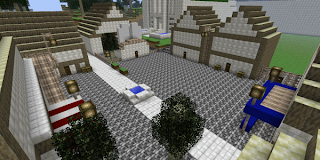 Hyrulecraft is a 1:1 scale replica of The Legend of Zelda: Ocarina of Time, in Minecraft! With the alpha map already available as a download, the project has now entered stage 2. The HC team hopes to have a completed server ready later this year which will include a unique Minecraft MMO experience including quests, NPCs, dungeons, free build zones, guilds, and more of the classic Minecraft stuff you know and love. Check out the server today!" I can say this is a very well crafted map and on scale almost perfectly. I cant wait to see what more the team can do with this map, what do you guys think? 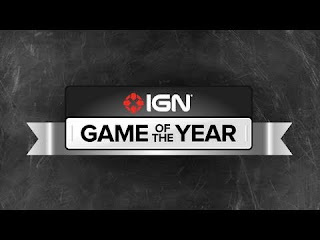 IGN has released the results for the Game Of The Year Award, the overall winner was Portal 2. However IGN set up polls which the fans could vote and decide for themselves. The people voted, and... the people's choice award was Skyward Sword! Which makes me wonder why it did not receive Game Of The Year Award? IGN gave it a perfect 10/10, however, Portal 2 received a 9.5/10, but of course this comes down to the people who voted. Skyward Sword won in these categories: Best Story, Best Adventure, and Best Sound. So there you have it. If you still don't own a copy of Skyward Sword I advise you to go pick one up! Do you guys think this was a fair decision by IGN? By now We all know about the book Hyrule Historia, which was released for the 25th Anniversary of Zelda. 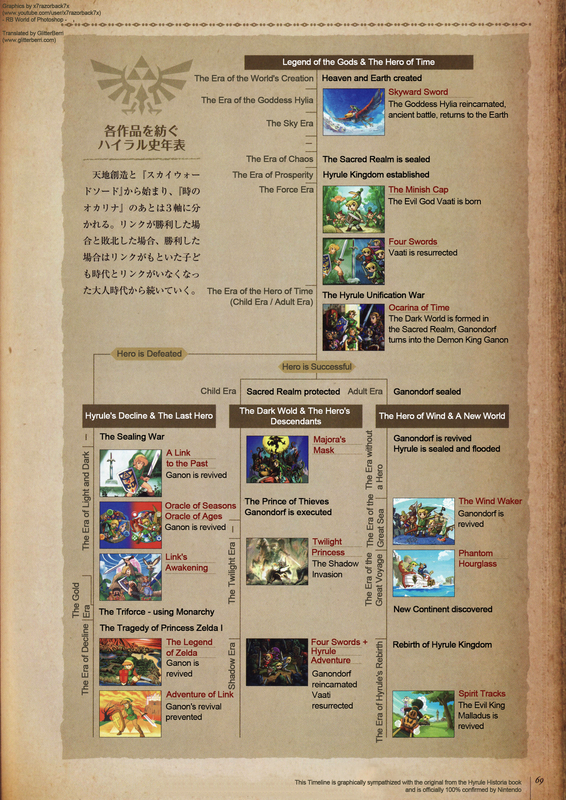 The book contains an official Zelda timeline, now this timeline can be very confusing. It still doesn't make sense how the timeline changes when the Hero of Time is defeated, because in Ocarina of Time Link doesn't get defeated he wins the battle against Gannon. I also think it's very weird that the most futuristic Zelda Skyward Sword is the first game in the timeline, well i hope it makes sense for you. GlitterBerri has translated the timeline for us using her skills, this is more or less old news now but it makes a great addition to Zelda Realm. -Writing “fire” in kanji and “ice” in katakana makes the titles inconsistent. They should either write both in katakana or both in kanji. So there you have it, a rumor confirmed fake. 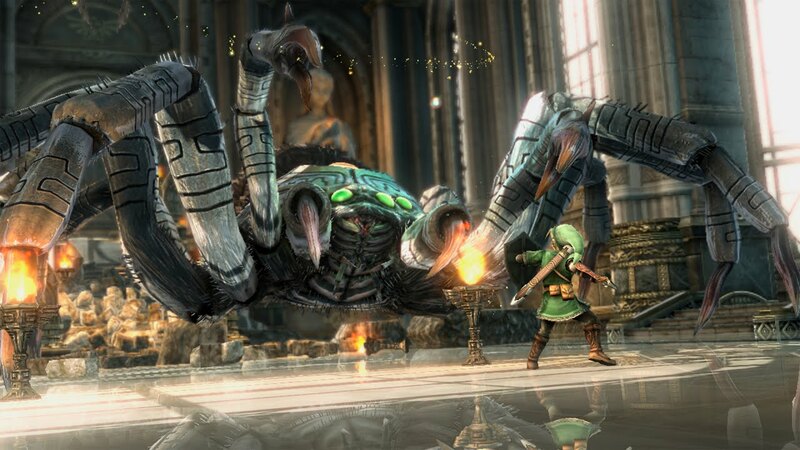 It makes me wonder what these Zelda games would have been like if they actually were real. What do you guys think? 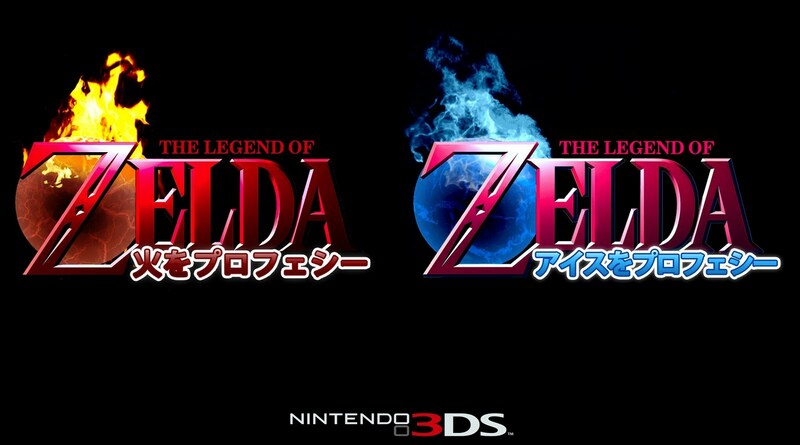 "We are already preparing a new game, a game in the series for the Nintendo 3DS, but don't think that it is a direct sequel to the Zelda titles released on DS. We are talking about a new game, but it takes much of what has been done on previous consoles." 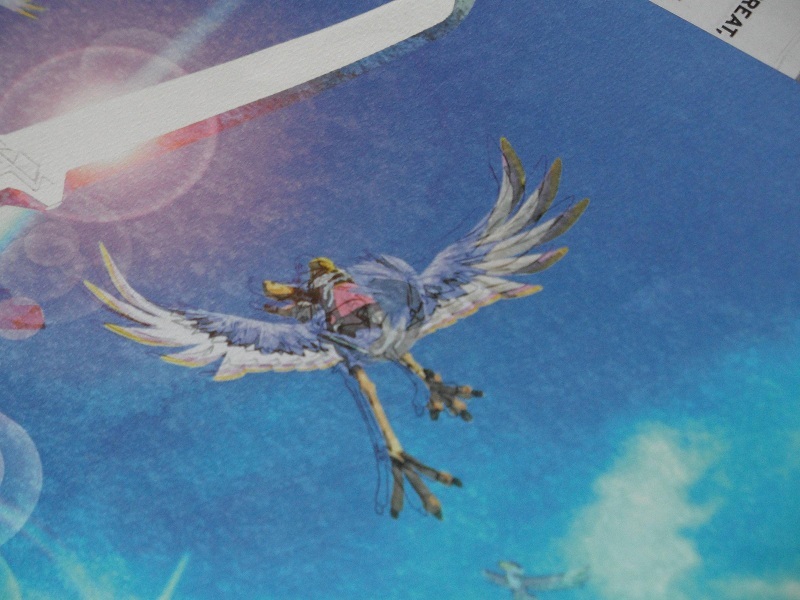 This is a very exciting time for Nintendo 3Ds owners, however this image could very well be fake. Its to hard to tell at this time, We will have to wait and see. Retro Studios Working On New Zelda Title? Retro studios have not worked on a major game since Donkey Kong Country Returns. Sure they developed some tracks for the recent Mario Kart 7 but they have been very quiet as of late. With the Wii U coming this year, it would seem like a good idea to start working on major Nintendo brands. Fingers crossed that we will see what Retro Studios has been working on at E3 this year. This brings up Zelda. Many have wondered what Zelda would be like with the original gameplay with a western style to it, personally, I think it would be weird at first but I am sure people would get used to it. Recently Shigeru Miyamoto suggested Retro would be a prime candidate for a collaboration on Zelda, Retro have proven its talent with Metroid and Donkey Kong, so fingers crossed! Last month IGN posted a video comparing Ocarina of Time to Skyward Sword. It was all about which game had the best controls, bosses, gear and story. The video showed off all these categories which, viewers needed to cast a vote to decide which game was better in these departments. 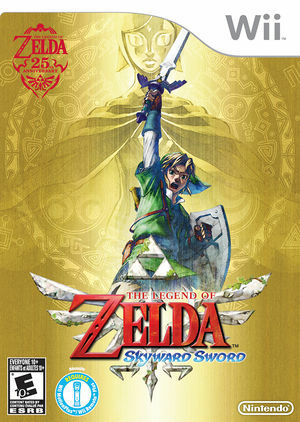 The overall winner was The Legend of Zelda Skyward Sword which received the most votes, however The Legend of Zelda Ocarina of Time got votes but never was the winner in any of the categories. This makes me wonder why? Ocarina of Time is a classic, it was way ahead of its time and everyone has fond memories of the game. The controls, bosses, gear and story in Ocarina of Time is superb, you would think that Ocarina of Time would have won in some categories. I am not saying that Ocarina of Time is better than Skyward Sword, I am saying Ocarina of Time brought new elements to the table and these elements have been used in countless Zelda titles. Both of these games are unique in different ways for example Skyward Sword has very creative gear and elements, the motion controls are spot on and has changed motion control gaming for Zelda titles in the future. If you would like to see the final results the video will be underneath this post. The Legend of Zelda Majora's Mask has been on the Wii virtual console since 2009 for 1000 Wii points. Club Nintendo are now running a special deal, Majoras Mask is currently only 150 Club Nintendo Reward points! I think this is a very good deal and will get more people playing Majora's Mask and hopefully increase the chances of a Majora's Mask remake for the 3DS. Hello everyone! My name is Shadow Link and I am 17 years old. I joined The Zelda Realm because I thought it would be a great opportunity to post topics about Zelda and express my opinions about the Zelda games, I am also a friend of ZeldaMasterfull's. I am a big Zelda fan and have been since 2001, my first Zelda game I ever played was The Legend of Zelda Ocarina of Time. I basically played that game to death. 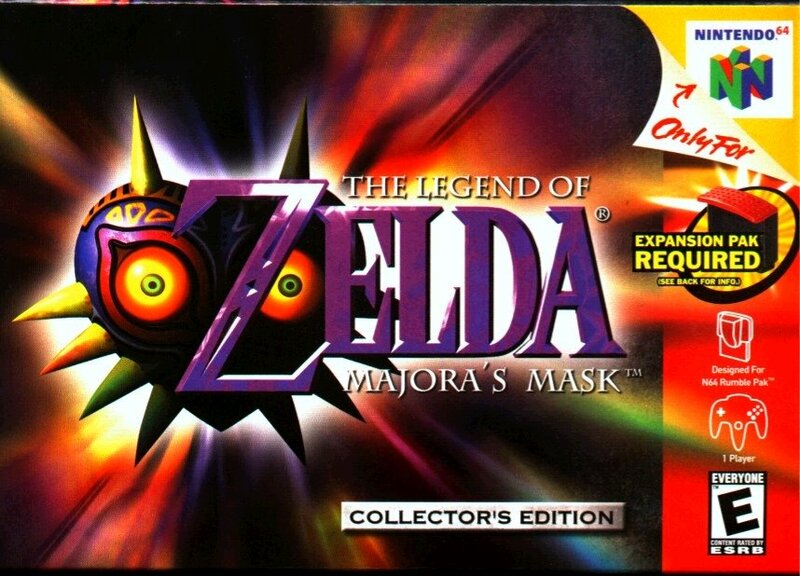 My favorite Zelda title is The Legend of Zelda Majora's Mask because it was set in a parallel universe and its one of the darkest Zelda games in history. In my spare time I make videos for my YouTube channel and hang out with friends at the beach. Hey guys, Klink here! Man, I miss posting on the site! Don't worry, it's not like I quit or anything. I'm usually just busy with school stuff and such. Onto the important news, I realized today at 3:00am that The Zelda Realm hit 10,000 total site views around a week ago, and I completely didn't notice! Man, that's a great milestone! It really proves how big the site is getting, and it's obviously all thanks to you guys, the viewers. I feel an important need to inform you guys about stuff like this, it's you who makes this possible in the first place. I just want to thank you guys so much before signing off. Oh, and one last thing. You may have noticed a lot of firing and hiring of staff members. Let's just say that a lot of them are not proving to be reliable. How unfortunate. Anyways, it's down to me, ZeldaMasterfull, and Shadow Link (a new member not properly introduced yet) who I think will truly improve the site's quality. Make sure to thank them too, especially ZeldaMasterfull for the great articles. So I want to thank you guys one last time, this really means a lot to me. Keep the support coming!